The timing for this special series affords an excellent opportunity to integrate a body of new syntheses relevant to school-based behavioral assessment. Burgeoning information regarding the extension of problem-solving logic into system-wide frameworks such as response to intervention (National Association of State Directors of Special Education, 2008) has facilitated knowledge of key constructs (e.g., data-based decision making, progress monitoring, universal screening) among service delivery providers. Recent collaborative publications by national agencies have highlighted staggering findings related to the mental, emotional, and behavioral needs of youth, suggesting both serious needs and promising service delivery options that often involve school-based settings (National Research Council and Institute of Medicine, 2009). This special series offers a timely and critical review of big ideas related to school-based behavioral assessment. Abstract. Rating scales developed to measure child emotional and behavioral problems typically are so long as to make their use in progress monitoring impractical in typical school settings. This study examined two methods of selecting items from existing rating scales to create shorter instruments for use in assessing response to intervention. 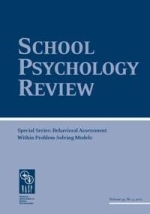 The psychometric properties of two sets of abbreviated rating scales derived from the IOWA Conners Teacher Rating Scale and the teacher-completed Peer Conflict Scale were examined and compared to the longer original versions of these scales. The rating scales were evaluated using data from a randomized, placebo-controlled, crossover trial of immediate release methylphenidate involving a sample 65 children between 6 and 12 years old who met research diagnostic criteria for attention deficit hyperactivity disorder and either chronic motor tic disorder or Tourette’s disorder. Specifically, the abbreviated and original versions of the rating scales were examined for internal consistency, temporal stability, concurrent validity, and treatment sensitivity. Results indicate that there were few significant differences between versions of the scales, which support the use of abbreviated rating scales for use in progress monitoring. Implications for practice and future research are discussed. Abstract. Research has been unsuccessful at revealing an analogue to curriculum-based measurement in the area of progress monitoring for social behavior. As a result, there is a need to develop change-sensitive, technically adequate, feasible progress monitoring tools for social behavior that represent general outcome measures of performance. The purpose of this research was to develop and evaluate the technical adequacy of a brief behavior rating scale (BBRS) that contained change-sensitive rating items. Using data from a randomized controlled study, extant rating scales were analyzed according to four change-sensitive metrics to detect a pool of rating items for inclusion in a BBRS. Next, successive iterations of BBRSs were analyzed to determine how few items a BBRS is capable of containing while maintaining adequate reliability and criterion-related validity. Results revealed that the change-sensitive metrics successfully identified several items upon which students demonstrated change in response to an intervention. Also, results indicated that a BBRS can have as few as 12 items and maintain adequate reliability and criterion relatedness. The implications of these results and directions for research on the use of BBRSs as progress monitoring tools for social behavior are discussed. Abstract. The purpose of this study was to examine the technical (psychometric) adequacy of office discipline referrals (ODRs) as a behavioral assessment tool for individual student, data-based decision making within a problem-solving model. Participants were 990,908 students in 2,509 elementary schools. Students were grouped into ODR cut points of 0–1, 2–5, and 6 or more total ODRs. Descriptive analyses indicated consistent mean ODR growth trajectories for each group. Logistic regression analyses showed that intermediate cut points (1 ODR, 2 or more ODRs) were moderately accurate in predicting total ODRs received, and accuracy increased throughout the fall. Specific problem behaviors were less predictive of total ODRs, although adding specific behaviors to intermediate cut points enhanced prediction to some extent. Results are discussed in terms of using ODRs to identify students in need of intervention and monitor progress. Abstract. Universal screening has been routinely advised for determining the presence of problems for initiating problem-solving processes and models. The aim of this study was to assess the effect of two screener development methods on the validity of score inferences for two teacher screeners of child behavioral and emotional risk. The reliability and validity indices associated with screener scores were compared by analyzing data for 472 children from 20 elementary schools who were screened for behavioral and emotional risk. Screener scores from both instruments were significantly related to academic achievement test scores, grades, and classification of at-risk students. Although there was evidence that specificity of risk classification was better for one screener, both instruments identified risk with good reliability and validity. A research agenda and practice implications are discussed. Abstract. Although substantial attention has been directed toward building the psychometric evidence base for academic assessment methods (e.g., state mastery tests, curriculum-based measurement), similar examination of behavior assessment methods has been comparatively limited, particularly with regard to assessment purposes most desirable within problem-solving models. Therefore, an informed weighing of the psychometric benefits of two behavior assessment options, systematic direct observation and direct behavior rating, was conducted to better inform decisions regarding method selection, use, and interpretation related to initial identification and monitoring of behavior concerns. Results of generalizability theory analyses revealed that both methods were equally sensitive to intra-individual differences in academic engagement; however, differences were noted with regard to the influences of both rater and time. That is, a large proportion of systematic direct observation rating variance was explained by changes in student behavior across days and rating occasions, whereas rater-related effects accounted for the greatest proportion of direct behavior rating variance. Both limitations of the current study, as well as recommendations for research and practice, are discussed. Since the measuring device has been constructed by the observer . . . we have to remember that what we observe is not nature in itself but nature exposed to our method of questioning. (From Physics and Philosophy: The Revolution in Modern Science, Werner Karl Heisenberg, 1958.) From phrenology to functional behavior assessment, assessment of children’s behavioral and emotional characteristics is an enterprise with a rich (although admittedly checkered) history. If we get it right, the impressive slate of accomplishments to date will lead to a promising future in our efforts to help children and their schools. As I read through the articles offered in this special series, I found myself not only enthusiastic about some of the new developments and research that are detailed, but also struck with the thought that this area has evolved considerably during my professional lifetime, and in the right direction as far as I am concerned. In the last several decades, investigators have made remarkable strides in developing and evaluating school-based prevention and intervention strategies for elementary school-age youth focused on the development of healthy social, emotional, and behavioral skills. Although there has been rigorous examination of the efficacy of some of these programs, many of the evaluations are characterized by pre-post and follow-up designs with assessment occasions that are separated by months. Given current policies and practices such as prereferral intervention mandates, response to interventions models, and continuous performance monitoring systems, educators and school mental health professionals are in need of tools that assess a student’s response to intervention in the context of a shorter time frame (e.g., short-cycle assessments). Abstract. Flanagan, Ortiz, and Alfonso (2007) recently developed the Culture- Language Interpretive Matrices (C-LIMs) for the cognitive assessment of children and youth from culturally and linguistically diverse backgrounds. To examine the utility of this new approach, we administered the Woodcock-Johnson Tests of Cognitive Abilities to a sample of students receiving English as a second language services in public school settings who had not been referred for special education services. Results of within-subjects analyses of the predicted effects of linguistic demand and of cultural loading on subtest scores in the C-LIM were nonsignificant. Although a statistically significant (decreasing) trend was observed for the effect of linguistic demand and cultural loading combined, post hoc analyses revealed that this finding was attributable to a significantly higher score on one subtest and did not reflect significant differences among all three subtests in this contrast. Moreover, only 13% of the sample had a pattern of test scores that was consistent with Flanagan et al.’s C-LIM predictions of the pattern of subtest scores predicted for children and youth from diverse backgrounds. In sum, results of our study suggest that further research is needed to substantiate the use of C-LIMs for diagnostic purposes with diverse populations. Abstract. Curriculum-based measurement of oral reading (CBM-R) is often used to benchmark growth in the fall, winter, and spring. CBM-R is also used to set goals and monitor student progress between benchmarking occasions. The results of previous research establish an expectation that weekly growth on CBM-R tasks is consistently linear throughout the academic year. The patterns of CBM-R growth were examined for a large sample of students (N _ 3808) from both general education and special education populations in second to sixth grades. Results support four general conclusions: (a) annual growth is more substantial within the general education population; (b) growth is more substantial in earlier elementary grades; (c) more growth occurs in the fall than the spring season (i.e., seasonal effect), especially within the early primary general education population; and (d) the seasonal effect is less pronounced within the special education population. Estimates of growth within and across seasons are presented and implications are discussed. Abstract. The Dynamic Indicators of Basic Early Literacy Skills (DIBELS) are brief measures of early literacy skills for students in Grades K–6 (University of Oregon, 2009; see Kaminski & Good, 1996). School psychologists and other educational professionals use DIBELS to identify students who are in need of early intervention. The purpose of this review was to synthesize the current psychometric evidence for each DIBELS indicator. Strong reliability and validity evidence was observed for DIBELS Oral Reading Fluency; however, evidence for the remaining DIBELS indicators demonstrated greater variability. Although the majority of evidence focused on individual score reliability and validity for single-point decisions, further studies are needed to determine effective practices for progress monitoring. Abstract. Individuals with autism spectrum disorders experience pervasive social and communication skill deficits. One of the most popular treatment recommendations to address these deficits is the use of social stories. Although social stories are beneficial at reducing many disruptive behaviors, empirical evidence for their use to increase social and communication behaviors is limited. The present study, conducted in a natural setting, investigated the use of social stories to increase the prosocial behaviors of verbal initiations and contingent responses in students with either autism or Asperger’s disorder. Results suggested that the efficaciousness of this widely accepted intervention is questionable and in need of further research.